At one point in Kenneth Lonergan’s Manchester By The Sea, a character experiences a panic attack brought on by frustration from seeing frozen meat in a freezer (the context being that the body of their father, recently deceased, is being frozen to be preserved for a burial to take place in the much warmer spring months). The only other person in this scene, Casey Affleck’s character, remarks how every time he sees frozen chicken, he needs to be taken to a hospital. This is intended for laughs, but it also summarises the film’s ability to blend scenes of unavoidable grief with light touches of humour, to make it feel a lot more human and grounded instead of going all out with its big emotional scenes. Last month’s Collateral Beauty represents how that can be blended in the worst possible way; Manchester By The Sea not only does it infinitely better (which isn’t saying much, because almost anything was better than Collateral Beauty), but sets a new standard to how grief should be represented as accurately and as emotionally damaging as possible in a movie. It will definitely not be for everyone, and I’ll admit that there were aspects to this film that I wasn’t entirely on board with, but it is a very strong movie that nearly anyone can relate to, especially if they too have gone through a period of grief. The film is about Affleck’s character Lee Chandler, a lewd and unfriendly janitor in Boston, receiving news that his older brother (Kyle Chandler) has just died from heart failure. This revelation forces him to return to the portside town of Manchester, where Lee has gained some unwanted notoriety for a major tragic incident that he was responsible for, not least from his former wife Randi (Michelle Williams). There, he learns that he has named guardian to his brother’s teenager son Patrick (Lucas Hedges), and while it does not seem to be in either Lee or Patrick’s best interests, both have no real choice but to work around the arrangement while also dealing with their own grief for the deceased, although Lee has extra cause for mourning as we learn through flashbacks the reason for his utter disdain for the town he has found himself returning to. When you do find out Lee’s past – fairly early on in fact, at least before the halfway point – you can totally understand why it would mess someone like him up pretty badly. All the pain and suffering, not to mention the minor notoriety it has brought him from several unforgiving members of the community, is completely warranted, and at no point do you feel your emotions be manipulated as you see it, because the movie is made with such steady and smooth hands that really allow the weight of the scene to feel refreshingly light. Lonergan lets scenes play out for as long as they need to, allowing us to see even the most minute and unnecessary details like signing a form in the hospital or an extended phone conversation, which can potentially put off someone with not quite as much patience – and I must admit, there were one or two scenes that I personally felt could have used a little trimming in the editing department – but within the body of the story, and its heavy themes and performances, they can be given some leeway due to their examining of how even the smallest things can bring about some truly uncomfortable thoughts and memories. This is a film that is primarily about grief and how best to deal with it, whether it be finding distraction after distraction so as not to deal with it face-on – Patrick fills up his time hanging out with his friends, including his two separate girlfriends (one of whom is played by Kara Hayward, the young girl from Moonrise Kingdom, who between this and Paterson appears to be taking the career path of appearing in small independent films that explore the nature of truly grounded everyday people) – or, in Lee’s case, trying to avoid it entirely. Affleck, who is truly excellent in the film, plays the character as someone who has really gone through some rough times, but never acts like a real victim; in fact, he’s kind of a arse, being anti-social and rude to several people, picking fights in bars with people who just look at him funnily, and just being a mostly unpleasant person who just happens to have done something horrible in his own past. However, as thoroughly unlikeable as his character can be, you completely understand his pain and suffering as he’s constantly reminded of said past, mostly through several flashbacks to slightly happier times with his now-deceased older brother, and Affleck is one of those actors that can make people you otherwise shouldn’t want to get to know suddenly become the most compelling figure you’ll come across in the entire movie. His performance is already garnering a lot of attention this awards season, and rightfully so; it’s a powerfully understated portrait of a man going through some unimaginable stuff, one that only an actor as sophisticated as Affleck can pull off without being too schmaltzy or sentimental. It’s not a film that is destined to be loved by everyone, in the same way that La La Land certainly is, mostly because of its heavier themes, stretched out running time of over two hours, and a plot that mostly stays in neutral once Lee actually reaches the town of the title. But definitely try and give it a chance even if this isn’t really your cup of tea, because you might be quite taken aback by how powerfully it can translate its core messages on grief and suffering without resorting to the same lows as Collateral Beauty did. Quite contrarily, Manchester By The Sea uses its humanising sense of humour, great performances, and strong direction and writing to do so; no hired actors to con Will Smith whatsoever. 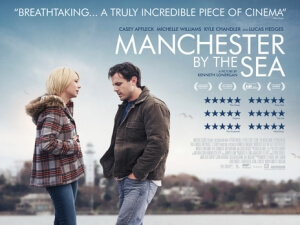 Manchester By The Sea deals with heavy themes of grief and loss in a unique and powerful way, mostly thanks to Kenneth Lonergan’s surprisingly funny script, tight direction, and strong performances including a never-better Casey Affleck.